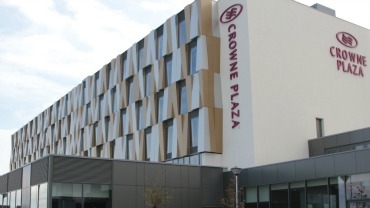 Dominvs Group, on behalf of the InterContinental Hotel Group (IHG), contracted McAleer & Rushe to design and build two separate hotels 100m from Aberdeen International Airport terminal: the Aberdeen Holiday Inn Express and the Crowne Plaza Aberdeen Airport Hotel. Meet IHG's high acoustic standards. Providing glazing specifications and façade construction advice. Conducted pre-completion sound insulation tests between floors, function rooms and bedrooms to meet both the hotel operator's and Scotland's building standards. We had to address two specific challenges on this project. There is no equivalent to England and Wales' 'Rooms for Residential Purposes' in Scotland's building standards. Use the results of the desktop study to determine if/where there could be any reduction in glazing specification in different parts of each hotel. The free track helicopter paths made it impossible to accurately predict where any helicopter noise would come from and where, within the hotels, it would have most impact. As a result, the glazing and façade specifications had to make allowances for the possibility that a helicopter could fly very close to or directly over the top of the hotels. 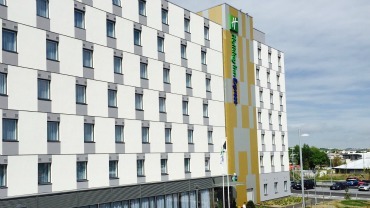 The Holiday Inn Express opened in May 2015 and the Crowne Plaza opened in September 2015.